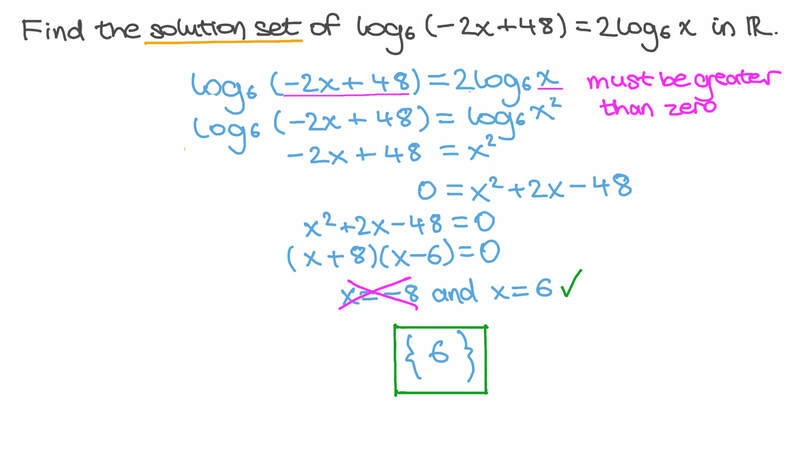 In this lesson, we will learn how to solve logarithmic equations using the laws of logarithms and the relationship between logarithmic and exponential functions. Determine the solution set of the equation l o g l o g l o g 8 8 8 ( 𝑥 − 6 ) + ( 𝑥 + 6 ) = 6 4 in ℝ . Find 𝑥 such that l o g ( 4 𝑥 − 4 ) = 2 . Solve the equation l o g  𝑥 − 𝑥 − 2  = 1 2 , where 𝑥 ∈ ℝ . Find the solution set of l o g l o g 6 6 ( − 2 𝑥 + 4 8 ) = 2 𝑥 in ℝ . Solve l o g 4 2 𝑥 − 2 6 𝑥 − 7 𝑥 + 6 = 1 , where 𝑥 ∈ ℝ . Find the solution set of  𝑥  + 𝑥 + 1 =  2  l o g l o g l o g 7 2 7 2 7 2 in ℝ . 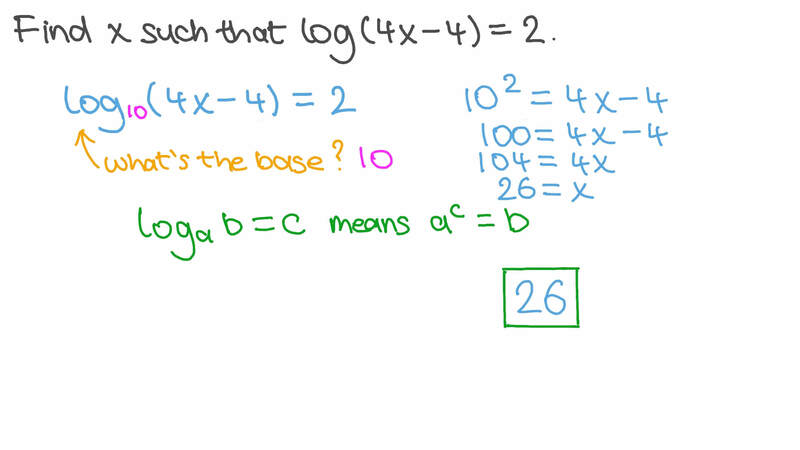 Determine the solution set of the equation l o g l o g 2 2 𝑥 = 4 − ( 𝑥 + 6 ) in ℝ . Solve l o g l o g 2 3 2   𝑥 − 8 𝑥   = 1 , where 𝑥 ∈ ℝ . Find the solution set of 3 + 2 4 3 = 2 4 4 × 3 2 𝑥 𝑥 in ℝ . Find the solution set of 4 + 2 = 5 1 6 𝑥 𝑥 + 8 in ℝ . Find the solution set of 3 + 2 4 3 3 = 3 6 𝑥 𝑥 in ℝ . 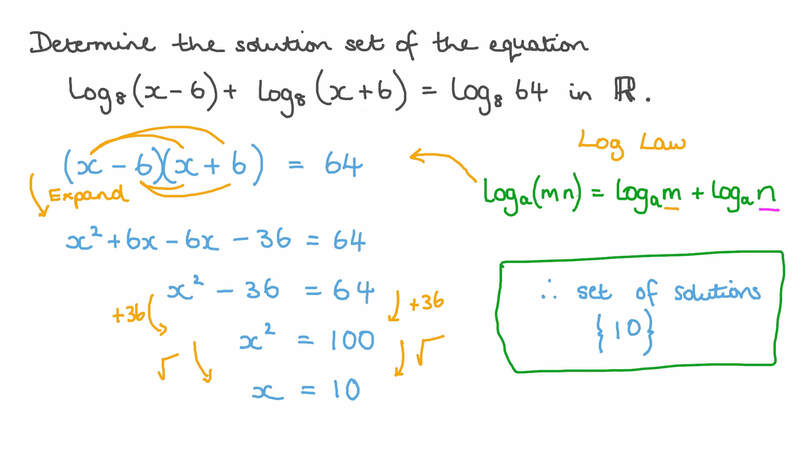 What is the solution set of the equation l o g 𝑥 ( 9 𝑥 − 1 8 ) = 2 ? Find the solution set of 4 − 1 0 2 6 × 2 + 2 0 4 8 = 0 𝑥 + 8 𝑥 + 8 2 2 in ℝ . Find the solution set of l o g l o g l o g 6 2 6 6  9 𝑥 − 2 7  = 2 𝑥 + 1 3 2 1 6 in ℝ . Find the solution set of l o g l o g l o g l o g 𝑥 𝑥 𝑥 𝑥 5 + 4 0 − 2 4 = 2 + 8 in ℝ . Determine the solution set of the equation 2 × 5 = 6 4 0 0 0 3 𝑥 𝑥 l o g l o g 3 3 in ℝ . Find the solution set of l o g l o g 𝑥 2 × 2 𝑥 = − 4 in ℝ . Determine 𝑓 ( 2 4 3 ) , given that the graph of the function 𝑓 ( 𝑥 ) = 𝑥 l o g 𝑎 passes through the point ( 8 1 , 4 ) . Find the solution set of l o g l o g l o g l o g 9 9 9 9 6 2 1 6 × 8 1 = 3 6 × 𝑥 in ℝ . Solve 5 = 1 5 l o g 6 𝑥 , where 𝑥 ∈ ℝ . Solve l o g 2 𝑥 ( 2 + 5 1 0 ) = 1 0 − 𝑥 , where 𝑥 ∈ ℝ . Determine the solution set of the equation l o g l o g 3 2 3  𝑥 − 5 𝑥 + 4  = 4 + ( 𝑥 − 1 ) in ℝ . Solve the equation l o g 𝑥 3 5 𝑥 = 5 𝑥 , where 𝑥 ∈ ℝ . If 8 𝑥 + 5 𝑦 − 𝑥 𝑦 = 3 l o g l o g l o g 6 6 6 6 3 , what is the value of 𝑥 𝑦 ? Determine the solution set of   5 0 3 + 3  = 8 l o g l o g 8  8 √ 3 𝑥 3 in ℝ .